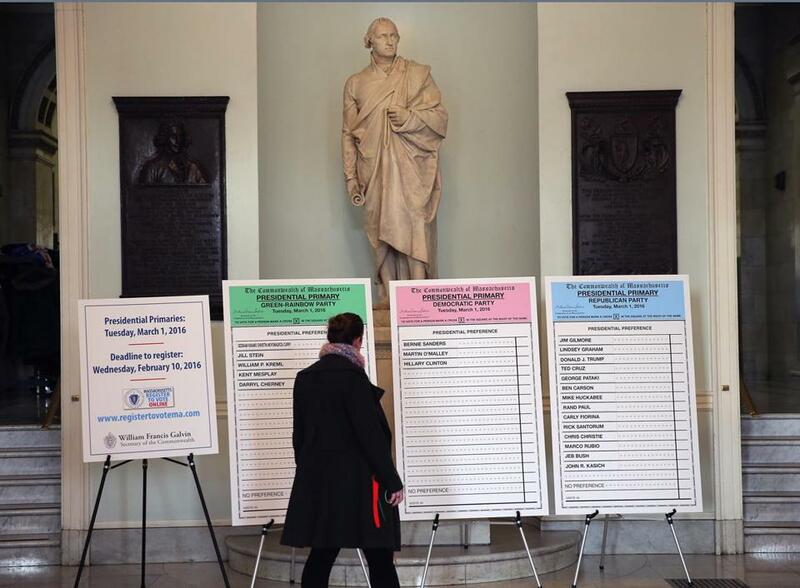 Examples of presidential primary ballots were displayed in the Massachusetts State House last month to inform voters. That’s where the confusion lies, Galvin says. In Massachusetts, an unenrolled voter can vote in any primary — Democratic, Republican, and Green Rainbow Party are the possible choices this year. A member of the United Independent Party can only vote in that party’s primary, but the party isn’t having one. Galvin said his concern was triggered by a “sudden influx” of people in the last few weeks who took to the state’s election website to register in time for the March 1 presidential primaries and clicked on the United Independent Party affiliation. He said they likely didn’t read their options closely and thought that they were registering as unenrolled. Wednesday was the final day for eligible voters to register for the upcoming state primary. It also marked the final day that voters could change their party status. WGBH-FM first reported the problem this week. The United Independent Party won official status in Massachusetts in 2014 when Evan Falchuk, who was running for governor at the time, earned 3.3 percent of the vote. “Overheated, unhelpful rhetoric,” he said on social media, apparently referring to Galvin’s statements. Galvin told the Globe it was “disingenuous” of Falchuk to suggest that people weren’t confused. “I guess I’m confused now as to what Mr. Falchuk’s problem is,” he said. Galvin said his office late last month mailed out 21,000 notices to people who are registered with Falchuk’s party to explain the possible mixup. Galvin’s office also placed disclaimers on the state election website to steer people away from clicking on the wrong affiliation box, he said. Galvin said around 5,500 people have changed their status from the United Independent Party to unenrolled since those notices went out. A spokeswoman for the United Independent Party said some members were unenrolling from the party just to cast ballots in the primary and planned to rejoin the party as soon as they had voted.